• Doesn't damage your pocket. • Keys and accessories are always in the same place. • Flat key, feathered key, car key, special keys, devices (screwdriver, inbusz key) too can be put also. • The handles can be made based on a pre-drawn, connected shape, semi-precious stones, favourite medals can be embedded or inserted into the keyholder or patterns, text or symbols milled, engraved, carved or branded in. • Can be made using various exotic or traditional wood and metals. Small series production - plastic serial production is under preparation. • Recommended for holding 1-40 keys. • Available in one, two or three axis forms. There are three types of the two axis models. • 3 monthes of guarantee. 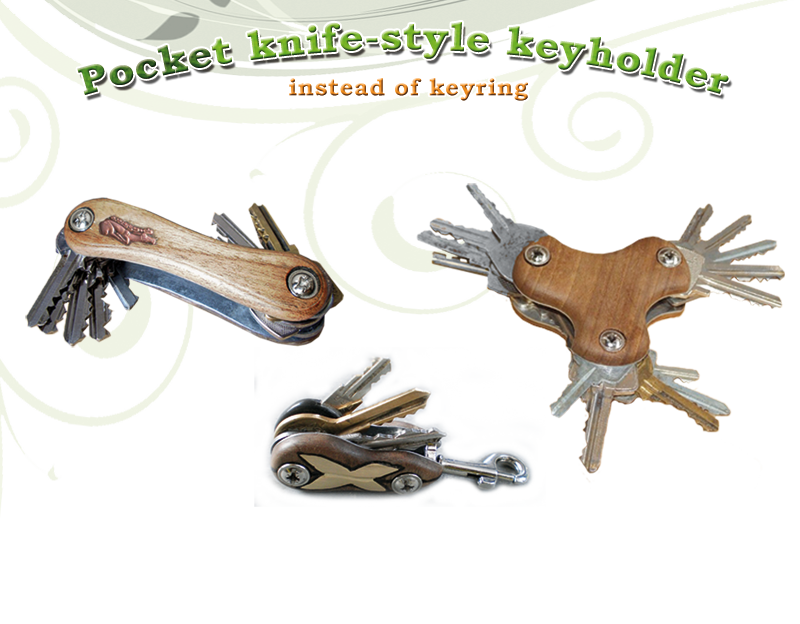 • The pocket-knife style keyholder is protected by patent.